I have friends who almost never let themselves do the really fun things they want to do during the semester. Five minutes later, though, I’ll see them scrolling through their Facebook feed. I call this low-density fun. Scrolling through your news feed or watching a few funny videos on YouTube is easy, and it’s sort of fun to do. However, because it’s so easy and feels so unlike “real” fun, it’s easy to not feel guilty about it – which leads to a lot of procrastination. The solution? Commit to having your high-density fun. If you want to play a video game later, commit to starting it at 8 p.m. Then, make sure all your work is done by then. Let your high-density fun create a deadline that propels you into focused work. 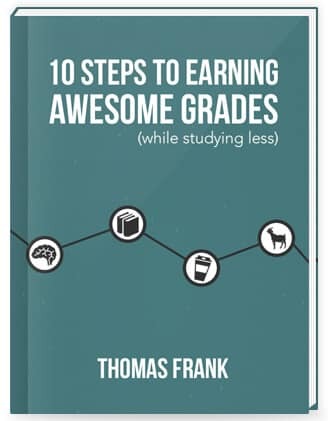 This video builds off of a tip from the 100+ page book I wrote called 10 Steps to Earning Awesome Grades (While Studying Less) – you’ll find it in the 7th chapter, which is all about defeating procrastination. Oh, and the book is completely free! To end, here’s a simple question for you – what high-density fun are you going to schedule into your day now? I think I’ll be playing some Civilization V tonight.